Saludos Amigos (Spanish for "Greetings, Friends") is a 1942 American live-action animated package film produced by Walt Disney and released by RKO Radio Pictures. It is the sixth Disney animated feature film and the first of the six package films produced by Walt Disney Productions in the 1940s. Set in Latin America, it is made up of four different segments; Donald Duck stars in two of them and Goofy stars in one. It also features the first appearance of José Carioca, the Brazilian cigar-smoking parrot. Saludos Amigos premiered in Rio de Janeiro on August 24, 1942. It was released in the United States on February 6, 1943. Saludos Amigos was popular enough that Walt Disney decided to make another film about Latin America, The Three Caballeros, to be produced two years later. At 42 minutes, it is Disney's shortest animated feature to date. In early 1941, before U.S. entry into World War II, the United States Department of State commissioned a Disney goodwill tour of South America, intended to lead to a movie to be shown in the US, Central, and South America as part of the Good Neighbor Policy. This was being done because several Latin American governments had close ties with Nazi Germany, and the US government wanted to counteract those ties. Mickey Mouse and other Disney characters were popular in Latin America, and Walt Disney acted as ambassador. 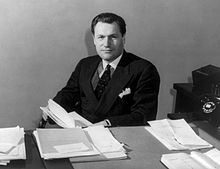 The tour, facilitated by Nelson Rockefeller, who had recently been appointed as Coordinator of Inter-American Affairs (CIAA), took Disney and a group of roughly twenty composers, artists, technicians, etc. from his studio to South America, mainly to Brazil and Argentina, but also to Chile and Peru. The film itself was given federal loan guarantees, because the Disney studio had over-expanded just before European markets were closed to them by the war, and because Disney was struggling with labor unrest at the time (including a strike that was underway at the time the goodwill journey began). The film included live-action documentary sequences featuring footage of modern Latin American cities with skyscrapers and fashionably dressed residents. This surprised many contemporary US viewers, who associated such images only with US and European cities, and contributed to a changing impression of Latin America. Film historian Alfred Charles Richard Jr. has commented that Saludo Amigos "did more to cement a community of interest between peoples of the Americas in a few months than the State Department had in fifty years". The film also inspired Chilean cartoonist René Ríos Boettiger to create Condorito, one of Latin America's most ubiquitous cartoon characters. Ríos perceived that the character Pedro, a small, incapable airplane, was a slight to Chileans and created a comic that could supposedly rival Disney's comic characters. This film features four different segments, each of which begin with various clips of the Disney artists roaming the country, drawing cartoons of some of the local cultures and scenery. In this segment, American tourist Donald Duck visits Lake Titicaca and meets some of the locals, including an obstinate llama. Pedro involves the title character, a small anthropomorphic airplane from an airport near Santiago, Chile, engaging in his very first flight to pick up air mail from Mendoza, with disastrous results occurring when near Aconcagua, and again while chasing a vulture on the return journey. And to make matters worse, Pedro gets caught in a terrible storm! But, he makes it back to the airfield safe and sound with the mail, revealed to only be a single postcard. This segment was later released theatrically as an independent short, on May 13, 1955 by RKO Pictures. Disappointed with Pedro as the image that the outside world had of Chile, cartoonist René Ríos Boettiger (known popularly as "Pepo") started one of the most famous Latin American comic magazines: Condorito. In this segment, American cowboy Goofy gets taken mysteriously to the Argentinian pampas to learn the ways of the native gaucho. This segment was later edited for the film's Gold Classic Collection VHS/DVD release to remove one scene in which Goofy is shown smoking a cigarette. This edit appears again on the Classic Caballeros Collection DVD. This sequence has since been restored as many fans have asked for the unedited version. The fully unedited version is available as a bonus feature on the Walt & El Grupo DVD release. Aquarela do Brasil (Portuguese for "Watercolor of Brazil"), the finale of the film, involves a brand-new character, José Carioca from Rio de Janeiro, Brazil, showing Donald Duck around South America, having a drink of cachaça with him and introducing him to the samba (to the tunes of "Brazil" and "Tico-Tico no Fubá"). Trailer of the movie, with images of copyrighted characters deleted. The film's original score was composed by Edward H. Plumb, Paul J. Smith, and Charles Wolcott. 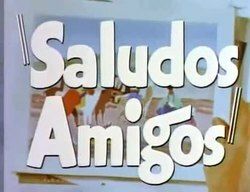 The title song, "Saludos Amigos", was written for the film by Charles Wolcott and Ned Washington. The film also featured the song "Aquarela do Brasil", written by the popular Brazilian songwriter Ary Barroso and performed by Aloísio de Oliveira, and an instrumental version of "Tico-Tico no Fubá", written by Zequinha de Abreu. "Aquarela do Brasil" was written and first performed in 1939, but did not achieve much initial success. However, after appearing in this film it became an international hit, becoming the first Brazilian song to be played over a million times on American radio. The film's soundtrack was first released by Decca Records in 1944 as a collection of three 78rpm singles. Side 1: "Saludos Amigos" b/w Side 2: "Inca Suite"
Side 3: "Brazil ("Aquarela do Brazil")" b/w Side 4: "Argentine Country Dances"
Side 5: "Tico-Tico" b/w Side 6: "Pedro from Chile"
The film was nominated for three Academy Awards in 1943. Saludos Amigos premiered in Rio de Janeiro on August 24, 1942. It was released in the United States on February 6, 1943. It was theatrically reissued in 1949, when it was shown on a double bill with the first reissue of Dumbo. In 1995, the film was released on Laserdisc under the "Exclusive Archive Collection" series. It was later released on both VHS and DVD on May 2, 2000 under the Walt Disney Gold Classic Collection) banner, and again on DVD on April 29, 2008 under the Classic Caballeros Collection banner. The film received a third DVD release on November 30, 2010, as a bonus Feature on the Walt & El Grupo DVD. A fourth release, the first on Blu-ray, was released on January 30, 2018 as Saludos Amigos And The Three Caballeros 75th Anniversary Edition 2-Movie Collection). ^ "Saludos Amigos: Detail View". American Film Institute. Retrieved April 22, 2014. ^ "Pedro" (in French). Retrieved December 3, 2010. ^ Gerald Wurm (May 15, 2008). "Mehr als 4000 detaillierte Zensurberichte zu Filmen, Spielen, Comics, Serien und Musikvideos". Schnittberichte.com. Retrieved November 26, 2012. ^ "Saludos Amigos & The Three Caballeros: Classic Caballeros Collection DVD Review". Ultimatedisney.com. Retrieved November 26, 2012. ^ a b "Walt & El Grupo DVD Review". Dvdizzy.com. Retrieved November 26, 2012. ^ "The 16th Academy Awards (1944) Nominees and Winners". oscars.org. Retrieved August 14, 2011. ^ "Allmovie entry". Allmovie.com. Archived from the original on July 19, 2012. Retrieved November 26, 2012. 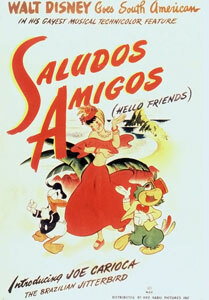 Wikimedia Commons has media related to Saludos Amigos.